By publishing Georgia Southern University’s student-run newspaper, The George-Anne, the library was able to showcase the university’s rich institutional history, create a fruitful relationship with the Office of Student Media, and boost readership of their scholarship, all in one fell swoop. Jeff Mortimore, Discovery Services Librarian, emphasized that publishing the newspaper in their IR, Digital Commons@Georgia Southern, allows readers to experience this as a living collection that gives up-to-date campus news, in addition to the historical archive. The newspaper makes seasonal sports news and graduations easily browsable in the IR. The library has developed a sustainable staffing model that splits the workflow with invested campus partners such as the Office of Student Media, which creates quality PDFs of the newspaper for the library to post each week. After developing a close relationship with the library, Student Media eagerly digitized the yearbook as well and the library helped them quickly make this sister collection widely available. 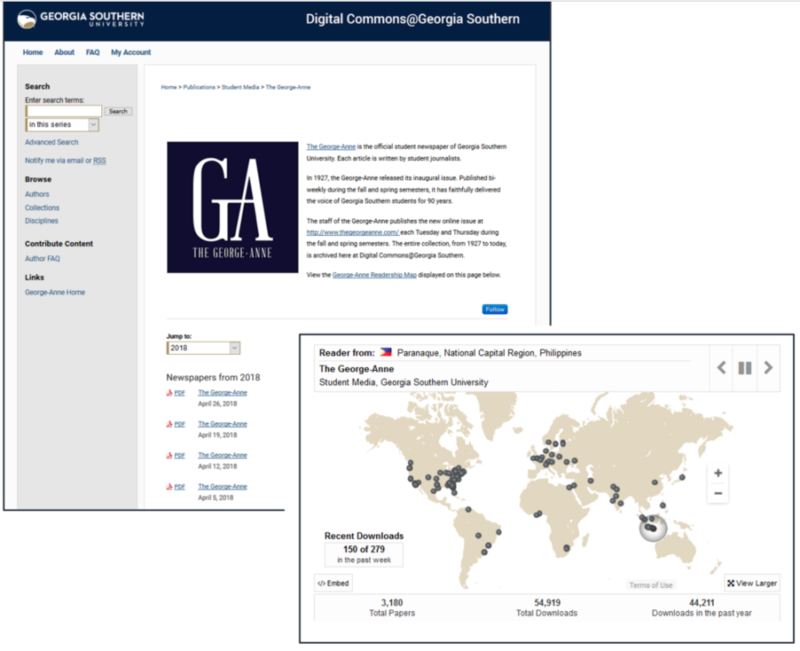 The offices of Marketing, Student Media, and the Dean of Libraries are excited that Digital Commons@Georgia Southern could meet their need to publish over 90 years of school newspapers. This historical archive was made possible with a LYRASIS grant from the Provost’s Office. In the year since they’ve published the newspaper online, they’ve gotten over 54,000 downloads and stakeholders are thrilled with the success.